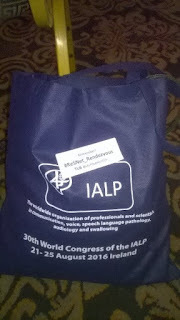 In place of our usual monthly #ResNetSLT Journal Club Tweetchat in August, the IALP Conference in Dublin provided an exciting opportunity for some face-to-face meetings. We used the hashtag #ResNet_Rendezvous to co-ordinate meetings linked to @IALPDublin2016 workshops on the theme of EBP and promoting practice-based and practice-led clinical research. It was great to meet new contacts and we had such amazing support from the Irish host association @IASLT - special thanks to Adrian Bradley, Aoife McGuire and Pauline Ackermann. It was also lovely to meet up with Margaret Walshe, Rena Lyons, Arlene McCurtin, Yvonne Wren and so many others too. Our #ReSNet_Rendezvous 'tweet meets' also proved to work well as twitter clinics – we're all learning together and it's great to be able to share tips we've picked up. A warm welcome in particular to Linda Schrey, Weibke Schraff and Maria Vlassopoulos. It was great that we also managed to keep in touch throughout the week with some other colleagues who weren't able to come to Dublin, and who reported that the tweets we shared helped them to at least have a flavour of this really great conference. Over the week there were more than 1,000 delegates from 57 different countries. There was a vibrant programme of keynote lectures, plenary sessions, free papers, research posters, and exhibitions - in addition to a stream of working party reports and forums, including an important focus on the WHO and International Communication Project developments. The over-riding impression of the event was of a deeply shared commitment to promoting clinical excellence through evidence-based practice.